Canadian teenager Denis Shapovalov is out of the U.S. Open, while veteran Milos Raonic is moving on to the fourth round. Raonic topped 2016 U.S. Open champion Stan Wawrinka 7-6 (6), 6-4, 6-3 to book a berth in the last 16 on Friday. Wawrinka, making his first return to the site of his 2016 triumph since undergoing knee surgery, showed he was still shaking off the ring rust despite encouraging victories in the first two rounds. The first set went down to the wire with nothing to choose between the two rivals, neither of whom were unduly troubled on serve. Raonic lost the first three points of the tiebreak before recovering to level at 3-3 and showed great strength of character to save two set points before going on to claim the opener. "It was tough," the big-serving Canadian said in an on-court interview. "I was fortunate I got through that because I was falling behind in that tiebreak." Wawrinka, who had won four of his five previous matches against Raonic, could not match his opponent's intensity in the final two sets and paid the price for some poor shot selection. The 33-year-old is one of the best all-court players on the men's circuit and his one-handed backhand is matched only by that of his compatriot Roger Federer in terms of elegance. It let him down repeatedly on Friday, though, as Raonic, sensing a weakness, targeted that side and duly prospered. The Canadian serve-and-volley specialist made sure he stayed on the front foot throughout, firing down 14 aces to Wawrinka's four and coming to the net behind his booming serve 37 times with a success rate of 73 percent. "I've got to just keep getting sharper," added Raonic, who is seeded 25th. "I've got to find a way to get ahead a little earlier in the points and not get too defensive. "If I can play on my terms I can compete against anybody." Next up for the 27-year-old is a last-16 clash with American John Isner, the 11th seed, who beat Serbian Dusan Lajovic earlier in the day. The 19-year-old Shapovalov dropped a hard-fought, five-set loss in the third round to No. 5 Kevin Anderson. Anderson took control of the fifth set with an early break and went on to a 4-6, 6-3, 6-4, 4-6, 6-4 victory, setting up a fourth-round meeting with ninth-seeded Dominic Thiem. While Shapovalov showed a lot of emotion on the court — fist-pumping and yelling after scoring on audacious backhand shots and throwing his racket in frustration after surrendering key points — the experience and imposing serve of the six-foot-eight South African proved too much to overcome. "It's a couple points here and there. Like I said, it was a close match. I had a lot of chances to break back, wasn't able to do it today. He served big when he needed to, played unbelievably big. Yeah, it was a great match," said Shapovalov. "We were both really happy with our tennis. It's great to be out there. Yeah, obviously it's disappointing to lose, but a lot of positives from it," he added. Still, Shapovalov, a 19-year-old form Richmond Hill, Ont., showed flashes of brilliance in the loss, particularly in the fourth set when he had the crowd on it feet as he broke Anderson in the deciding game. 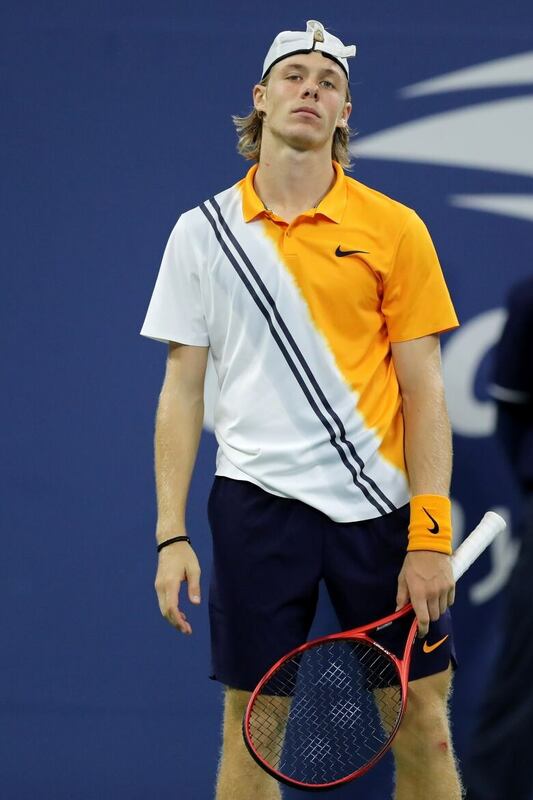 Shapovalov battled in the fifth set when he fought off four match points en route to winning the ninth game, but Anderson held Shapovalov to love in the deciding game to take the match. The Canadian prodigy said his game has grown in leaps since his run to the fourth round of the U.S. Open in 2017. "I feel like I've come back here a year — from last year, it's been a year now, and I feel like such a different player. I feel like I've improved so much in my game, mentally," said Shapovalov. "I just feel like I belong out there this year. I'm able to compete with anyone out there, as I showed today. I feel like my game's at a different level."